Slowly opening the door felt like a mistake. I knew nothing good could lie in wait behind that heavy wood and metal barrier. But I’m an urban explorer, and my instincts got the best of me. The door’s creak made me question what I was hearing. The unearthly howl resonated throughout the desolate hallway. Suddenly, bits of wood lying on the ground sprung to life and latched themselves onto doors: doors that could’ve led to safety, and the warm bed I knew was waiting for me at home. The hospital didn’t want me to leave. Oddly enough, I didn’t want to leave it, either. Daylight isn’t the first title from Zombie Studios, the creators behind the widely successful Blacklight: Retribution, but it’s as ambitious as any first title from an up-and-coming developer trying to cut its teeth. Imagine, if you will, a game that randomizes not only your environment, but the subtle details contained within. Daylight randomly generates a new layout each time you start the game. Procedurally generated games aren’t anything new, but pairing the idea with a horror setting is something that hasn’t been done before. 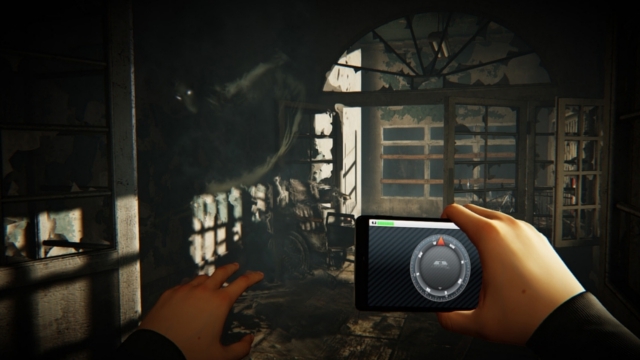 “Whenever you play a horror game for the first time, naturally, it’s terrifying. But once you replay it, all the suspense is gone,” said Zombie Studios community manager Collin Moore. According to Moore, the main reason to implement a procedurally generated environment was to keep players on their toes; no two games could be the same. I watched several people play through the demo, and while everything looked similar in terms of atmosphere, the actual layout was different each time. It’s a good system that really makes the game stand out, but I feel like some more architectural variety would benefit the game tremendously. The game gives you control of an unnamed urban explorer who wakes up in an abandoned hospital on a routine exploration. Your only source of light is your cell phone, which also doubles as a compass to aid in navigation. The gameplay is limiting and basic, just as a horror game should be. Taking a similar approach to horror as Amnesia, Daylight features no combat. The only way to ward off ghosts is to find flares or glow-sticks scattered around the hospital. That concept alone makes traversing the lonely hallways of the hospital incredibly unnerving. Gameplay is like a first person Metroidvania game, with exploration and note-taking as crucial elements for success. This also means that the game will feature extensive back-tracking, so those of you who hate retracing your steps, consider yourself warned. All in all, Daylight is an incredibly promising horror game, one that I’m very excited to play when the full game releases on Steam sometime in the near future.